So, Barcelona will seek to win the Club World Cup for a third time when they meet River Plate in Sunday's final (10:30 GMT). We will have live text commentary on Sunday on the BBC Sport website. Many thanks for your company. Goodbye. Luis Suarez has grabbed a coat and is now doing a television interview on the side of the pitch. Is that a smile? Barcelona will meet Argentina's River Plate in Sunday's final. Will Lionel Messi recover from injury in time to face the club from his homeland? 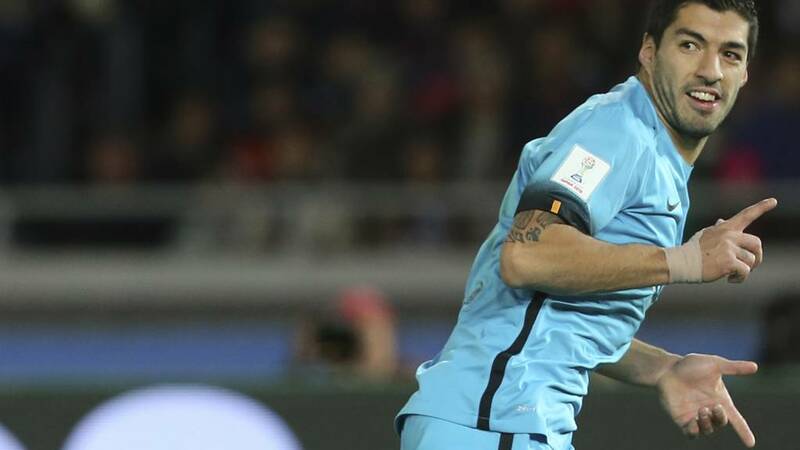 Luis Suarez hits a hat-trick in the absence of injured team-mates Lionel Messi and Neymar to book Barcelona's place in the 2015 Fifa Club World Cup final. Robinho's 2015 Club World Cup campaign is finishing the same way as his Manchester City career did...with a whimper. He will end this match as an unused substitute. A flurry of late corners for Barca before Sergio Busquets curls another chance wide. Standing ovation for Andres Iniesta as he makes way after running himself into the ground. Excellent performance by the Barca captain. Coming on is Sergi Samper. Ten minutes to go and Barcelona have enjoyed an incredible 74% possession this match. That's what you call one-sided! Barca are playing keep-ball after Adriano comes on to replace Jordi Alba. There are plenty of Guangzhou fans in the crowd but they have seen their side picked apart by a clinical Barcelona. You wouldn't rule out a fourth goal. Luis Enrique is thinking ahead to Sunday's final with River Plate. Sergi Roberto is replaced by Sandro Ramirez. Hat-trick for Luis Suarez! Excellent penalty to seal a fine individual performance. Who needs Lionel Messi? Gift for Barca as Munir El Haddadi is brought down in the box by Huang Bowen. Luis Suarez has the ball in his hand. Hat-trick for Luis Suarez? Don't rule it out. The former Liverpool man has looked razor-sharp and is showing no sign of slowing down 25 minutes from time. Guangzhou are really up against it as Barca hunt a third goal. It is not only Barcelona fans who will be hoping Lionel Messi recovers in time to make Sunday's final with River Plate. The entire population of Argentina will be praying he is available too. Anyone who doubts how serious Barcelona would take this competition should take one look at Luis Enrique's celebration when Luis Suarez scored his second. The Barca boss raced out of his seat to punch the air. He has only just sat back down. Meanwhile, his opposite number Luis Felipe Scolari looks miserable. This could get messy for Guangzhou. Barca have upped the tempo and the Chinese defence is under serious pressure. Another chance for Luis Suarez before Andres Iniesta ruffles the roof of the net. That was sublime from Suarez...a goal worthy of winning any tournament.